Save time, hassle and money! 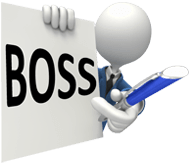 BOSS now provides a total SMSF outsourcing service covering the whole SMSF admin and auditing process with extremely competitive value-priced packages to make life SIMPLE! Upload the data we need following our checklist. Print financials, tax return & other documents and get them signed. Contact us for highly competitive rates! Any fund above 25 hours will not be covered under the package and will be quoted separately. Actuary certificate fee is an additional cost. Within 3-4 weeks, your fund is ready for lodgment (subject to quick query reply). There will be an additional charge if a contravention report is required. So take the headache out of SMSFs and make more profit NOW! 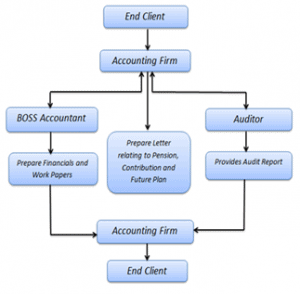 Don’t require an audit? Then have a look at our normal casual SMSF outsourcing services. 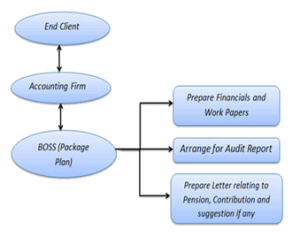 BOSS (Back Office Shared Services Pty Ltd) is Australia’s premium smsf outsourcing provider supplying well-trained high-quality accountants and bookkeepers. To discuss your needs and how we can help, Book a Consultation NOW!